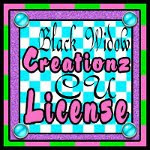 Just wanted to show off this tag that I made using the new April Desktop girl by Arthur Crowe, which you can find at his store here- http://arthurcrowesfactory.com/store/ You must have a license and display it within your finished creation. I used the FTU kit by Crystal's Creations called Smoking Tatta. You can get that kit HERE!